On 16 February, Egypt’s music scene lost the renowned composer Ali Osman Al Haj (also known as Ali Osman). Born in 1958 in Omdurman, Sudan, Osman’s passion for music brought him to Cairo in 1978. Though at first he thought Egypt would be a stop on his way further, he made his second home here and founded a family. Adopted by Egypt, Ali Osman is considered among the third generation of Egyptian composers, listed beside names such as Baligh Hamdi (1932-1993), Rageh Daoud (born 1954) and Omar Khayrat (born 1949), among others. Besides his compositions, Osman’s biography is rich in academic accomplishments, while as a dynamic artist he made a strong impact on the community, particularly through his work as artistic director and principal conductor of the Al Nour Wal Amal (or Light and Hope) Orchestra, an ensemble consisting of visually impaired and blind women musicians. I had the chance to meet Ali Osman on several occasions in the context of his work with the Al Nour Wal Amal Orchestra, which even if it represented an important part of his activities, remains but a fraction of the musical depth and versatility he represents. In November last year, as I was interviewing Ali Osman for a project, he spoke mostly about his arrival to Egypt and work with the orchestra, revealing one side of his musical passion. “In Sudan I was a self-taught musician, playing rock music on guitar and drums. I got to a stage when I needed more knowledge and skill. I felt that my self-teaching techniques started being a limitation. I realised that either I should start studying professionally or give up music altogether,” he spoke with his characteristic soft tonality. Naturally, Osman could not give up music and, following his secondary education, he began looking for a conservatory oversees. This change of plan proved very rewarding for the young musician. At the Cairo Conservatory, he studied double bass with Rodney Slatford (USA) and then composition with a number of renowned Egyptian professors including Gamal Abdel-Rahim, and during his postgraduate studies with Awatif Abdel-Kerim. His professors also included Bertold Hummel (Germany) and Robert Woshborn (USA). 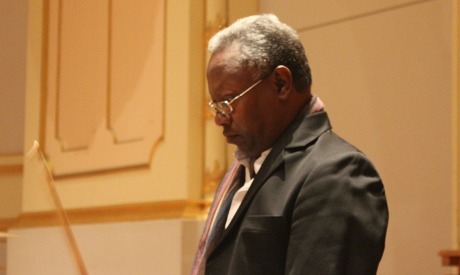 As he graduated and matured academically, writing his thesis on traditional Sudanese and Arabic music, Osman began teaching composition, counterpoint and harmony at the Cairo Conservatory in 1990, and in 1999 at the Higher Institute of Arabic Music in Cairo. Alongside his work at Al Nour Wal Amal and the conservatory, Osman kept making his mark in composition. In 2000, he was granted a four month scholarship as “composer in residence” by Prohelvetia Cairo, and travelled to Switzerland where he also recorded his first full CD by the Swiss Radio. Following Abul Eid’s passing in 2004, Osman became fully in charge of the orchestra, a task he carried out with profound dedication until the last days of his life. Acting as a mentor, conductor and often a father, Osman shaped the musicians, patiently carved their understanding of the material and helped them create the most beautiful art. He was their conductor, artistic director and tutor, but also in many ways their friend. And though the association relies on the expertise of a number of professional musicians, Osman was the orchestra’s solid artistic backbone. He chose the repertoire, deepened the delivery of already mastered compositions and pushed the musicians to learn new ones, often walking them through the work note by note. With all the challenges that can come with this ensemble, he not only embraced the work but also seemed to be enjoying it on the musical and human levels. “It is a different kind of work from working with sighted musicians,” he told me during the interview. On the very few occasions when I had the chance to watch him working with the girls, he would walk them through the score, making sure that each note is clean and well heard, and each motion well respected. At times, he would sit at the piano, with one or two musicians by his side duly following his instructions. During the final rehearsals the association’s hall was filled with musicians. Osman would walk in among the girls, whisper to them or tap them on the shoulder and then the music would take on a new, more vibrant shape. During their performances, he often stood to the side of the stage, or at the back, watching and listening. 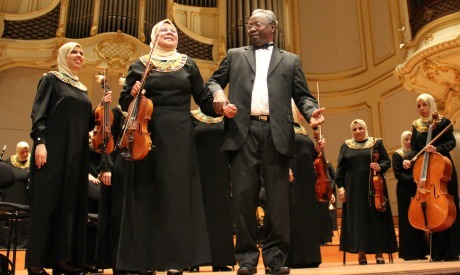 As the orchestra received strong applause, time and again, in Egypt and abroad, Ali Osman was proud and happy for the musicians, but always very humble. As a prolific composer Osman’s interest in traditional music and his formal conservatory education merged in a unique creative manner, translating into works for orchestra, chamber ensembles, solo instruments and voices. Representing the third generation of Egyptian composers, he remained deeply rooted in his origins, touching on the idioms of the south, only to create rich amalgams at the thematic and formal levels. He juggled Arabic musical modes and rhythmic patterns and Western harmonies; he explored and experimented, pushing the music towards a contemporary imagery of sound. Always nurtured by traditional material, Osman would find in it inspiration for many of his compositions, from orchestral works such as a symphonic poem, A Day in the Life of a Shepherd in the Sudan or A Nile Trip from the South to the North, to chamber works. Many of Osman’s compositions featured the instruments in their original contexts and formats, such as El-Maqamat El-Masri (Modes of Egypt), a work that revives the solo harpsichord embedded in Arabic modes or El-Mohager, a short piece for flute, oboe and riq (Arabic tambourine). A number of Osman’s works were published by Oxford University Press and Peermusic in Germany. Many of his compositions have been performed in Egypt – at the Cairo Opera House, the American University in Cairo, among other venues – and internationally, in Germany, Italy, Spain, Switzerland, Austria, China, the USA and the UK. His Afromood for violin, piano and tambourine, was performed very recently, on 8 February 2017, by the Seattle Symphony Orchestra, USA. 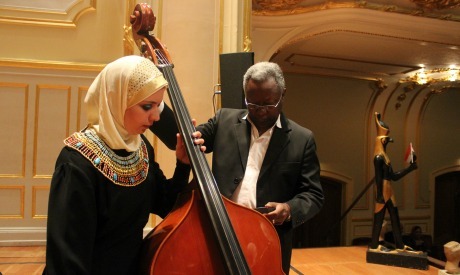 Entitled “Music Beyond Borders: Voices from the Seven,” this series of free concerts was the orchestra’s project aiming to raise awareness of and give a platform to music from the countries (including Sudan) that are subject to Trump’s travel ban. A few months earlier, in September 2016, Osman’s compositions were featured by the Arab Youth Philharmonic Orchestra at the Young Euro Classic music festival in Berlin. Osman also contributed to numerous publications, writing on folk and traditional music idioms and their contemporary contexts. He co-wrote with several scholars, including Samha El-Kholy, the series of books issued by the Culture Ministry: Egyptian Contemporary Music (2000–03). He was also on the musical jury of the Arab Fund for Arts and Culture in 2012. As the creative field mourns the composer, conductor and educator, it seeks consolation in the strong mark he left on the music field – and in the many valuable offerings he leaves us with.